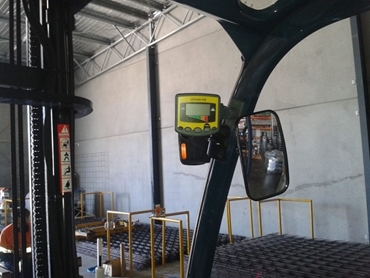 Accuweigh Newcastle recently supplied loadcell forklift scales to be fitted to forklifts at Toyota Material Handling (TMH) in Beresfield, New South Wales. The loadcell forklift scales are part of a nationwide trial of a standardised weighing system for TMH’s forklifts required to be fitted with onboard scales. Accuweigh’s LiftLog 100 loadcell forklift scales display the live weight of goods being lifted and feature visual and audible overload warning alarms to warn the operator when the SWL of the fork truck has been exceeded. Accuweigh has configured a separate alarm for TMH to warn the operator when the forklift is lifting items exceeding the SWL of pallet racking used in the warehouse. Key features of LiftLog 100 loadcell forklift scales include user-friendly operation, large LCD display, which can be easily read in bright sunlight, fully sealed to a waterproof IP67 rating to eliminate potential water damage, and a unique mounting bracket for the unit’s weight display that allows fitting in almost any position. The LiftLog Series of loadcell forklift scales also features LiftAlert, a load monitor with early warning of tip-over point for forklifts traversing rough, uneven ground; and Speed & Distance 200 for forklift speed and distance monitoring and speed limit alarms. Australia’s leading industrial weighing company, Accuweigh specialises in onboard loadcell scales for forklifts, loaders and trucks/trailers. Eight branches across mainland states provide superior product support to ensure complete client satisfaction.